Sylvia Ncediwe Mdunyelwa is a top singer in the richly traditional South African jazz scene. She began in the 70s and became known internationally in the 90s. She also acts on South African television, has a weekly radio-show in Cape Town, owns a TV- and film-production company and is setting a jazz school up in her township Langa. Sylvia Ncediwe Mdunyelwa comes from the South African township Langa. Already in the 70s she sang in Victor Ntori´s sextet and was soon singing with nearly all leading musicians in the Cape Town jazz scene like Merton Barrow, Wiston Mankuku, Nick Carter and Duke and Ezra Ngcukana. In 1990 she was awarded a grant by the Educational Opportunities Council, which enabled her to study for six months in the USA at the UCLA in Los Angeles, where she was taught by Kenny Burrell and others. These experiences gave her career in South Africa new impetus and brought her international acclaim. In 1994 she came to Germany for the first time, and in 1997 visited South America thanks to an exchange program and gave a concert in Bogota. Her performance at the Standard Bank Jazz Festival in Grahamstown in 1998 was recorded and later issued as African Diva, Live in Africa. 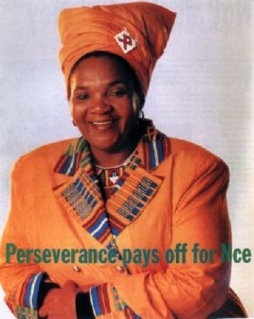 In 1999 she at last got a contract with the world-famous label Blue Note, then in 2000 her first studio-CD Ingoma (Song) was produced by her earlier colleague Victor Ntoni. In it Sylvia Mdunyelwa directly developed the great South African jazz tradition and worked with some of the most important talents of township jazz. Apart from singing, Sylvia Mdunyelwa is still an actress on South African television and had a role in a BBC Documentary about the life of Bishop Desmond Tutu. Every Sunday she presents her own radio show ´Voice of Jazz´ in P4 Radio in Cape Town and is a program advisor for the classical jazz transmitter ´Fine Music Radio´. Her newest project is setting a jazz school up in her home town Langa.